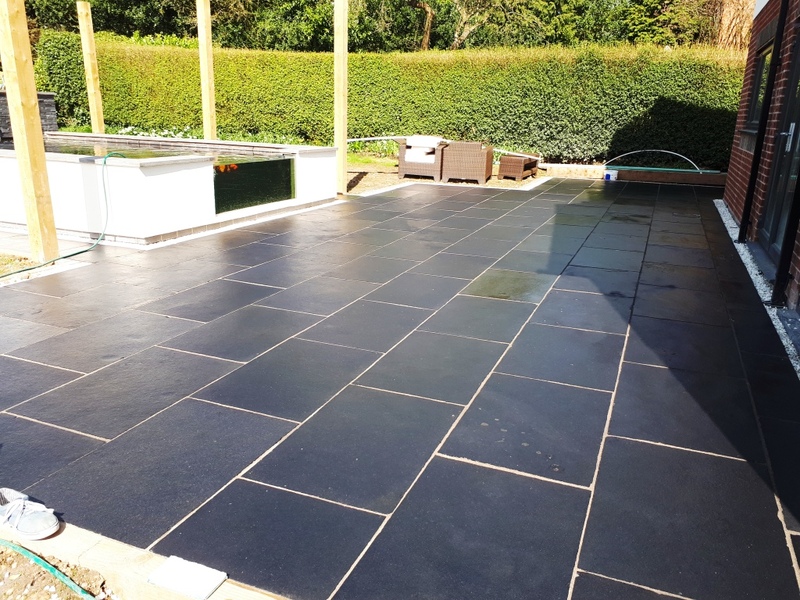 A local company in Bromsgrove were commissioned to lay a stunning and expensive Black Limestone patio for a customer who was renovating their property. 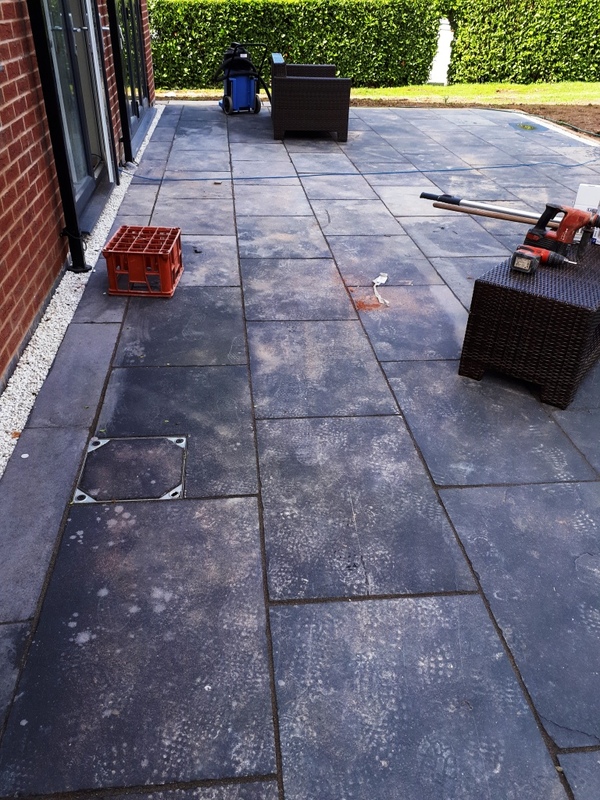 Unfortunately, the company tried to clean the finished patio with brick acid, and because limestone is generally very porous and acid sensitive this discoloured the tiles to a rather unsightly, dull grey – a far cry from what their customer was expecting! The company facing a large bill contacted Tile Doctor for expert advice to see if the beautiful tiles could be restored. If Tile Doctor couldn’t come to the rescue, then the company would have no choice other than to replace them at their own expense. 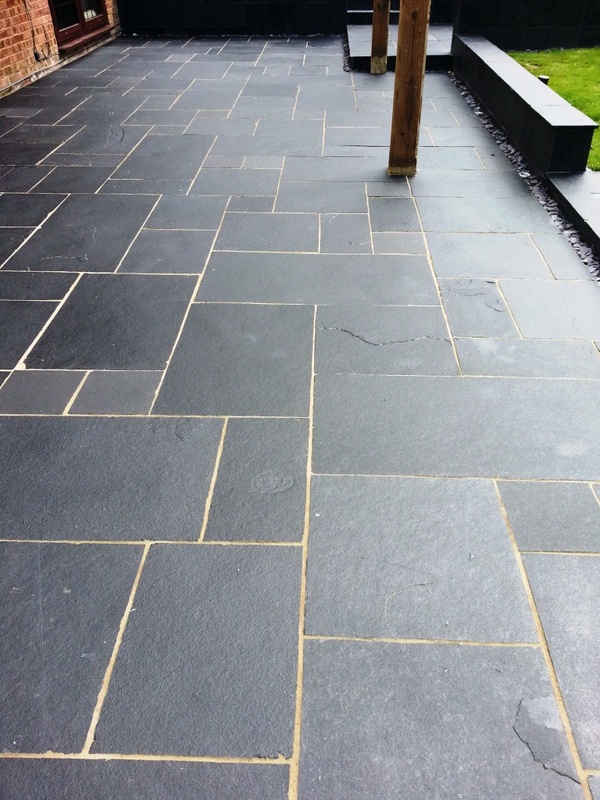 Black limestone paving has become incredibly popular over the last few years as its dark tones suit the current trend for a monochrome palette. It is also hard wearing and readily available. 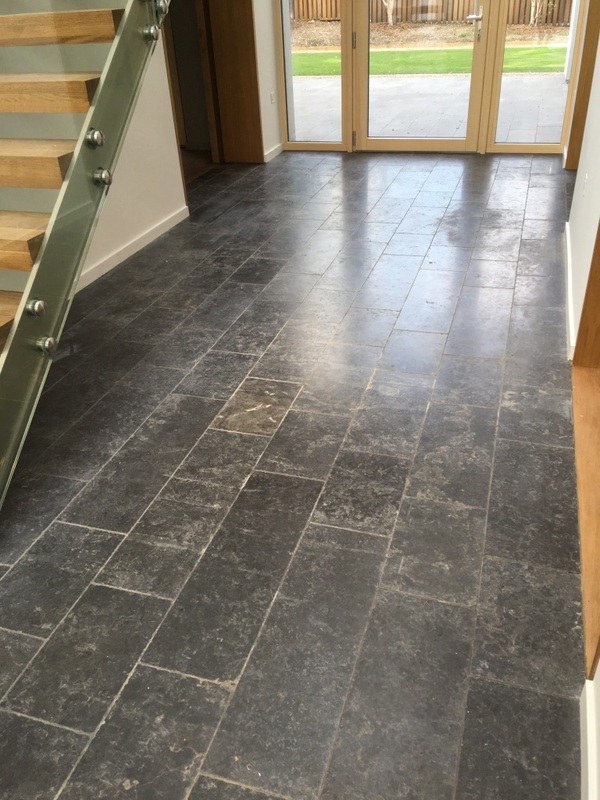 Tile Doctor specialise in the restoration of all types of tile and stone and as their local agent, I was asked to go over and see what could be done. I realised that the brick acid will have damaged the surface of the stone so to restore it I first tried applying a coarse 200 grit diamond burnishing pad. 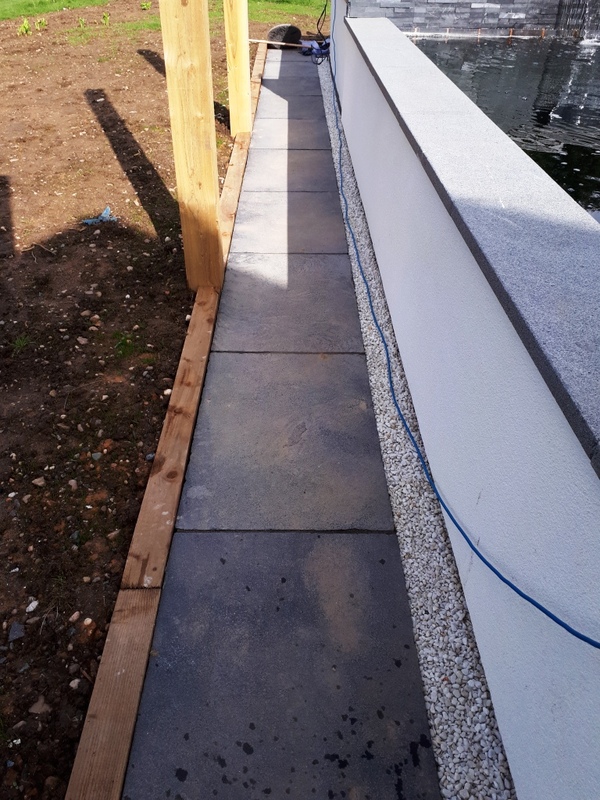 The pad successfully demonstrated that the appearance could be restored and impressed with the difference the site foreman booked me in to complete the whole patio. 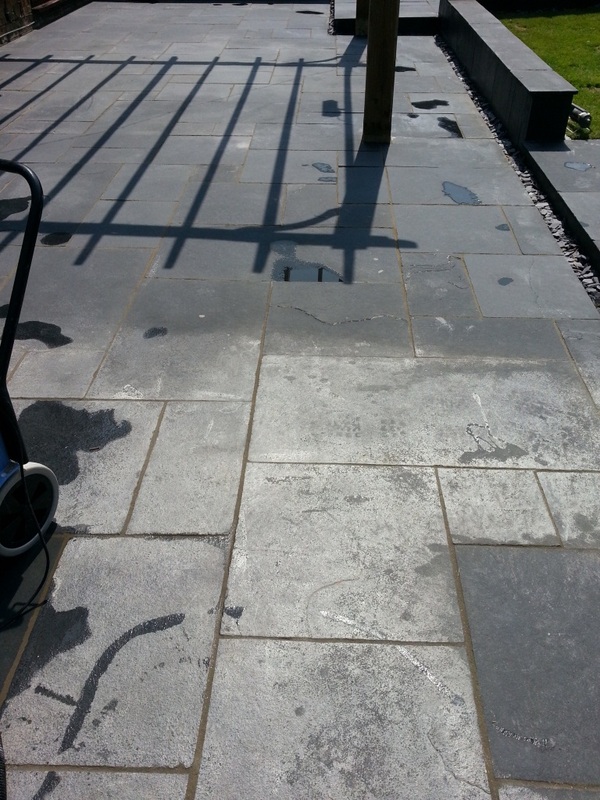 Luckily the weather forecast was set fair for a few days, which would be needed to clean and seal the patio. Made with industrial diamonds and available in different sizes and grits, burnishing pads are ideal for restoring the appearance of polished stone floors. 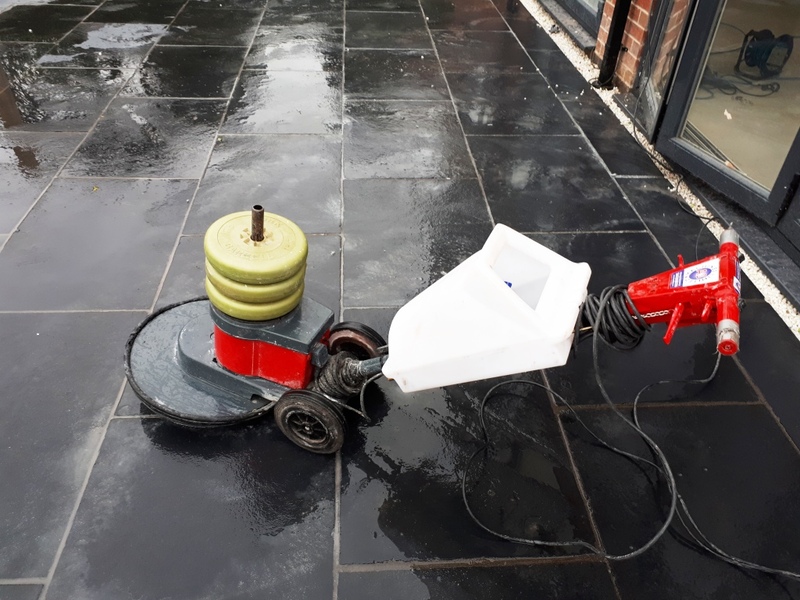 The first step was to work on the tiles with a course 200 grit diamond pad fitted to a weighted rotary machine and lubricated with water. This took off a layer of the limestone, bringing back the original black appearance of the tiles. 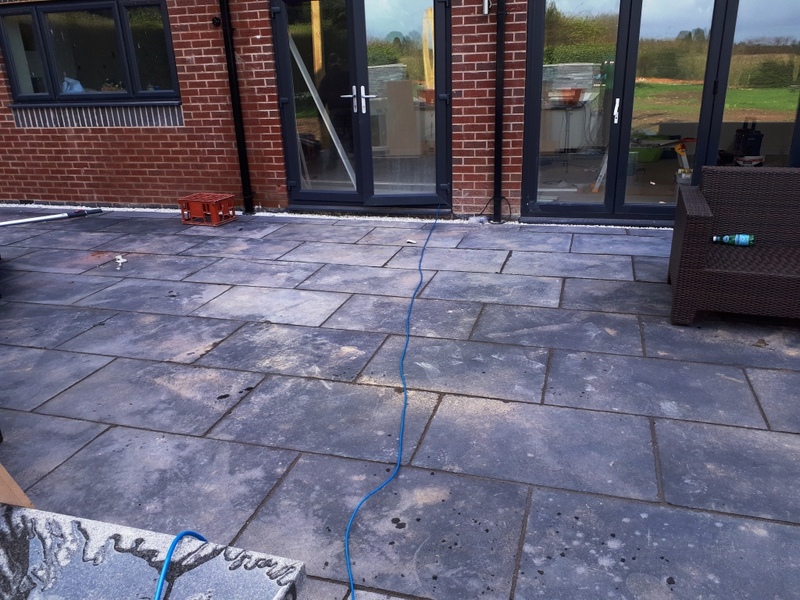 Next the patio was worked on with 400 grit diamond pads followed by 800 grit pads – the first stage of polishing – and each application was cleaned off with water. 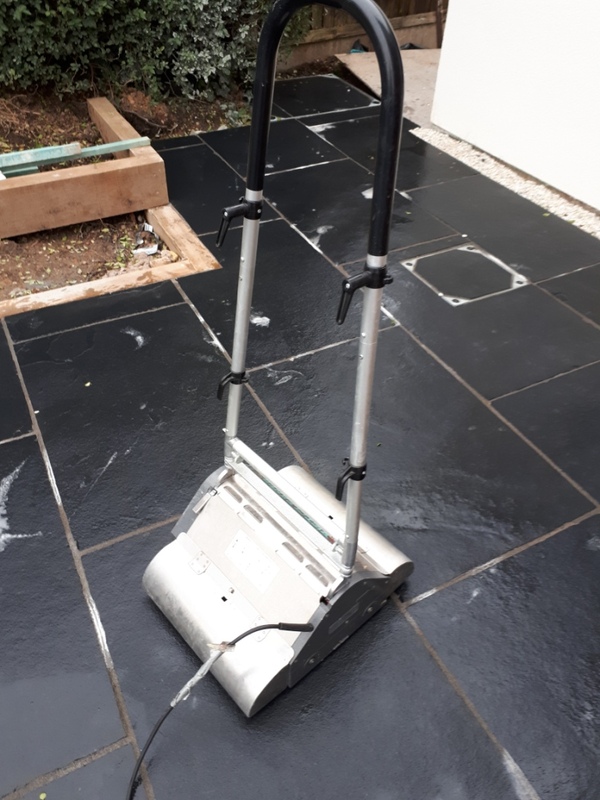 Because the property was being renovated there was a lot of dirt on the tiles and grout from construction, so I scrubbed in medium dilution of Tile Doctor Pro-Clean using a CRB (counter rotating brush) machine. Once done I rinsed down the area with more water and left it to dry. As you can see from the pictures it was a large area, so this work took two days to complete. 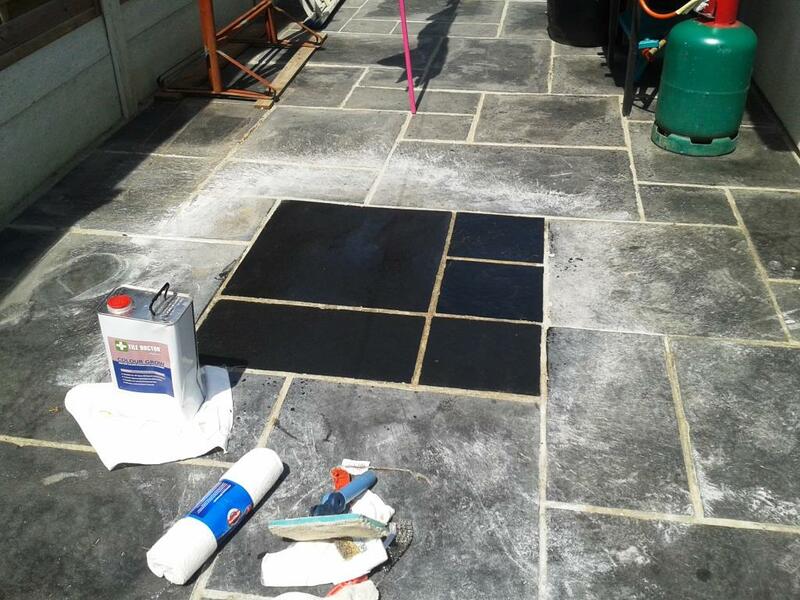 I returned the next day to start the sealing process beginning with the application of Tile Doctor Stone-Oil which restores the deep black colour and texture to the limestone, it’s also an impregnating sealer that adds protection and improves mechanical strength once cured. I allowed this to dry for 24 hours and then applied a coat of Ultra-Seal, a no-sheen natural-looking sealer formulated to provide maximum stain protection. 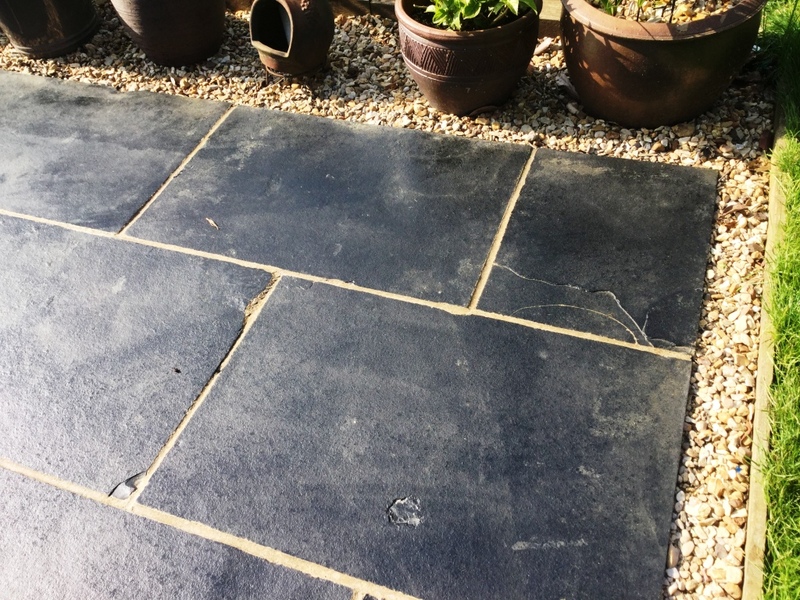 Earlier in the year I was contacted by a client down in Broadstone (a town supposedly named after a local legend) to revamp 100 square metres of black Limestone patio, which hadn’t looked right ever since it was first laid. 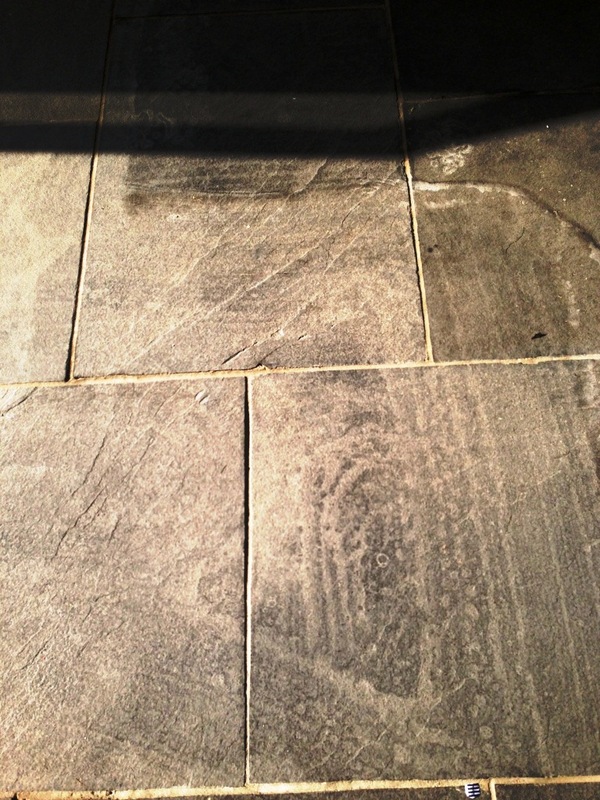 The main problem was water ingress where water had been allowed to seep into the stone due to a poor sealing job. 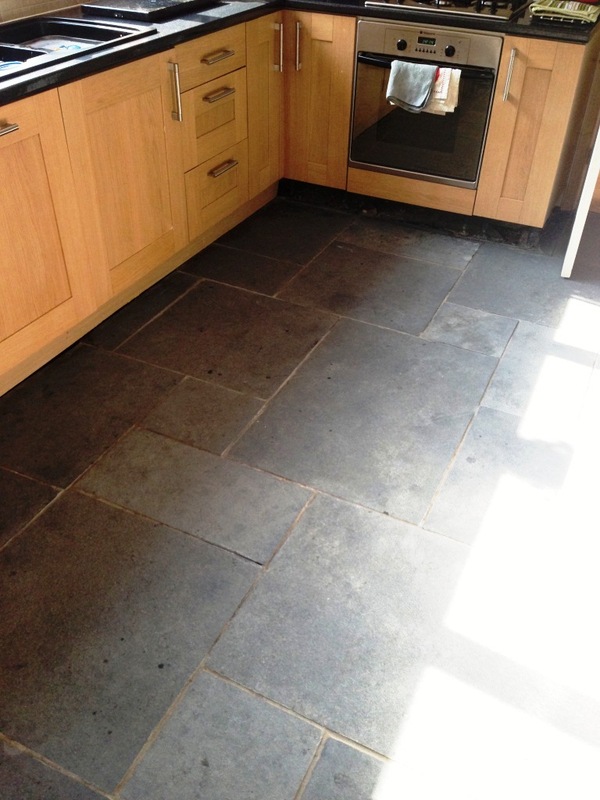 This had caused natural salts to form, and the resulting rough surface had collected grout haze at installation. 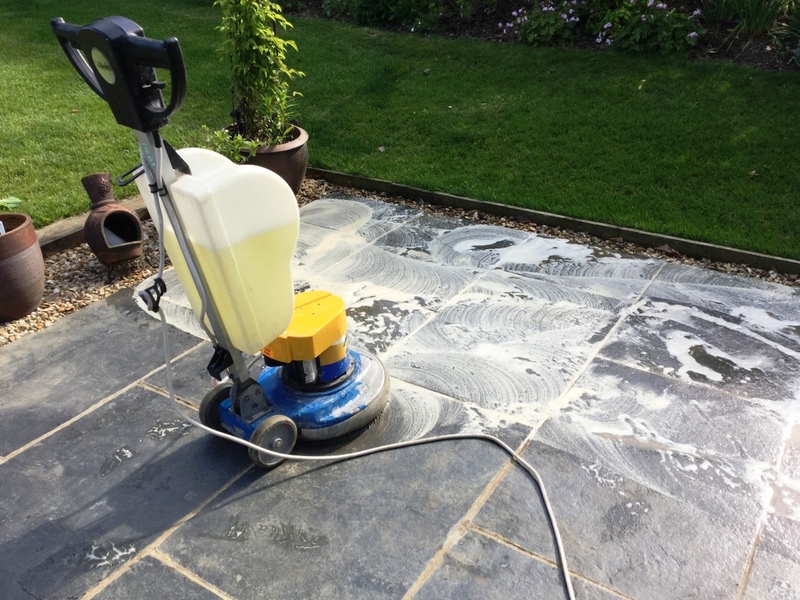 I decided to run a test on a small patch of the patio to determine the best methods for cleaning and removing the grout haze. 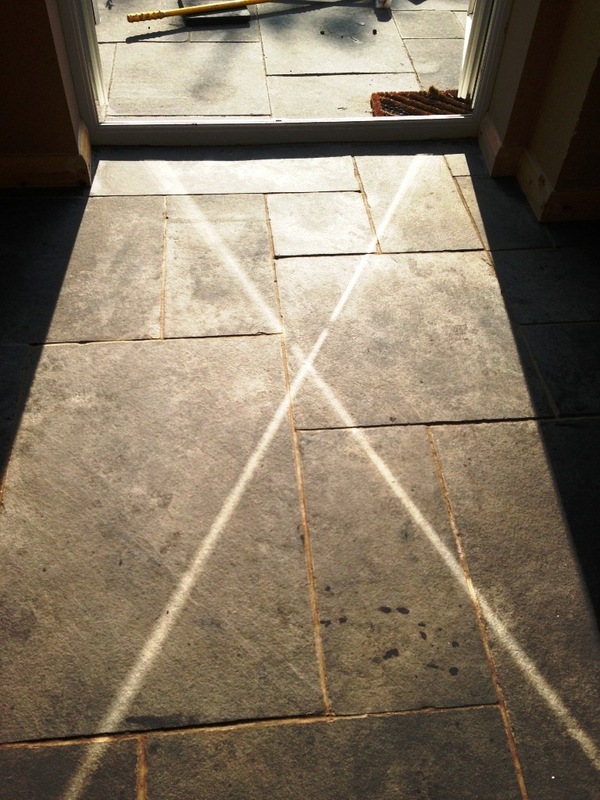 I decided to conduct my test on just one square metre of the Limestone patio. First of all, I used Tile Doctor Grout Clean Up on the grout, a cleaner which helped to remove the grout haze by penetrating beneath the surface and lifting the muck out. After cleaning the grout I moved onto cleaning the tile itself, using a solution of Tile Doctor Pro-Clean and clean water in combination with a black buffing pad. After achieving some great results with this cleaning method, I left the test area to dry completely before the seal, as any excess moisture left on the surface could potentially affect the performance of the sealer. My choice of sealer was Tile Doctor Colour Grow. 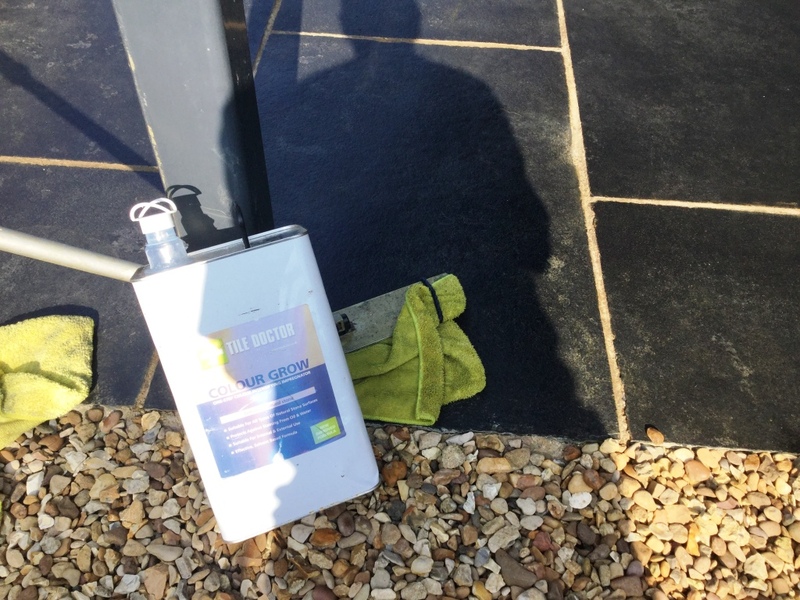 Colour Grow is a multi-use product which works well on both internal and external unpolished surfaces. 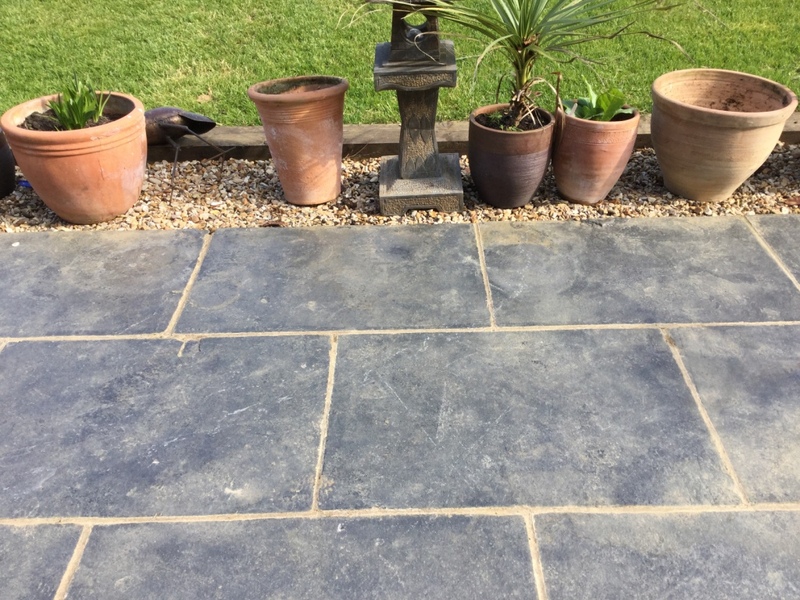 One of the great things about Colour Grow is that it is a colour intensifying sealer, meaning it really helped to bring out the black colour in the Limestone which had previously been affected by dirt and water ingress. The sealer will also provide durable protection against these types of problems in the future. 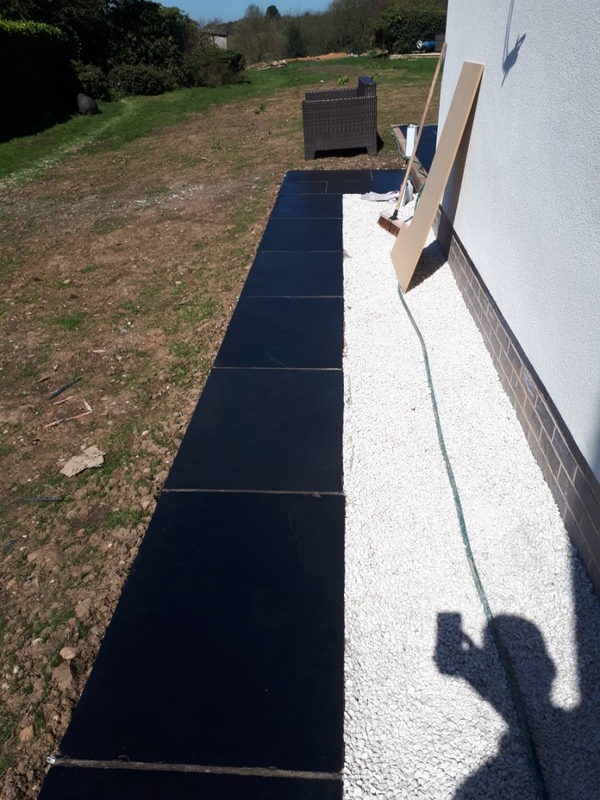 As you can see from the photos, the result of my test was very good – the stone became almost completely black once again, and the defects in the grout were successfully removed. Nonetheless, I decided to leave the test patch for a month to see how well it withstood the effects of the weather. 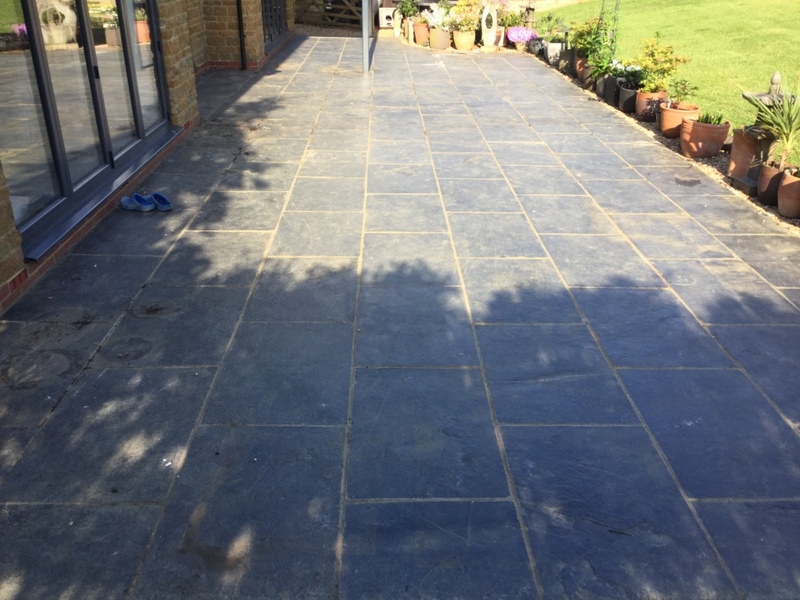 The test patch proved very durable – proving that the sealing had been done properly this time – and my client subsequently hired me to restore the remaining 99 square metres of patio! 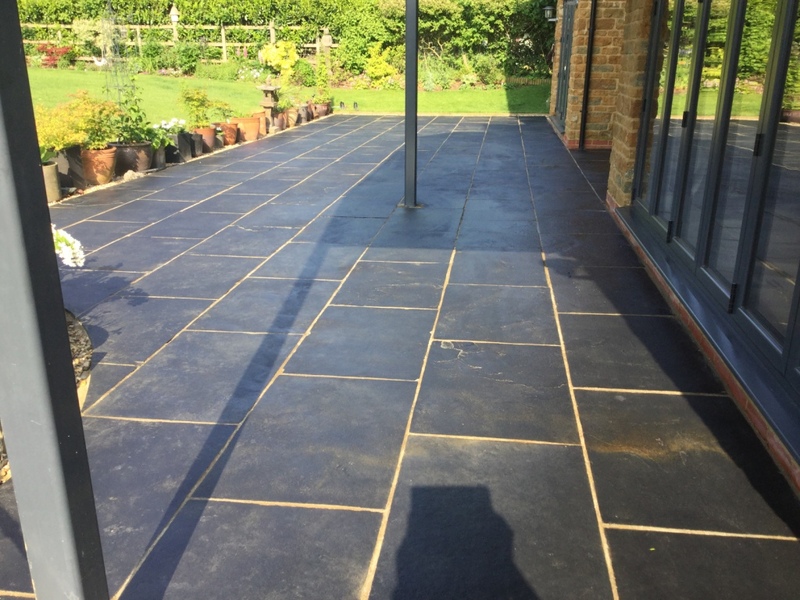 A sealer for internal use had been applied to this external black limestone patio in Crowborough and as you can see from the photograph below it had become badly affected by weather and was basically looking a real mess. 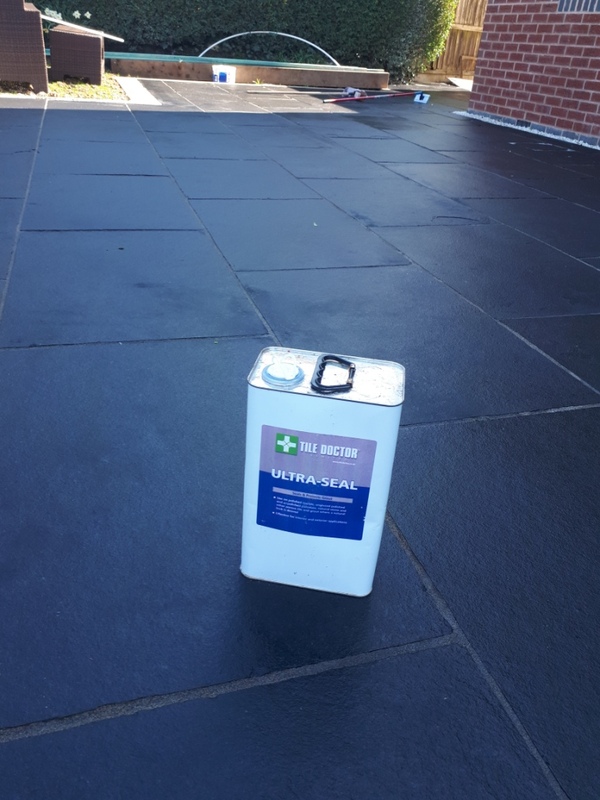 Working outside does have advantages in that there is a lot less preparation to do to protect other surfaces so it wasn’t long before we got to work with the application of a strong dilution of Tile Doctor Pro-Clean which is a multi-purpose cleaner and stripper. 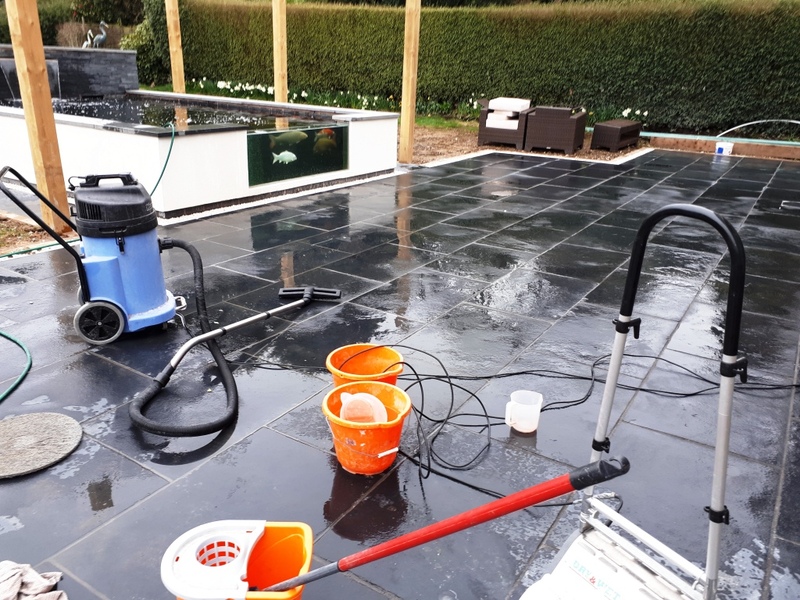 The Pro-Clean was left to soak into the Limestone for a while so it could get to work on the remaining sealer and make it easy to remove; the next step was to use a high pressure washer fitted with a spinner attachment so not to upset the grout between the tiles. This action removed the dirt and old sealer and just needed a final rinse to wash off any remaining cleaning product before sealing. The patio was left to dry off overnight and fortunately due this year’s warm summer we were able to return the next day to seal the Limestone with two coats of Tile Doctor Colour Grow which unlike the previous sealer can be used on external applications, it will also protect the patio going forward making it easier to clean as well as bringing out the natural colours in the stone. I think you will agree the patio has been transformed. 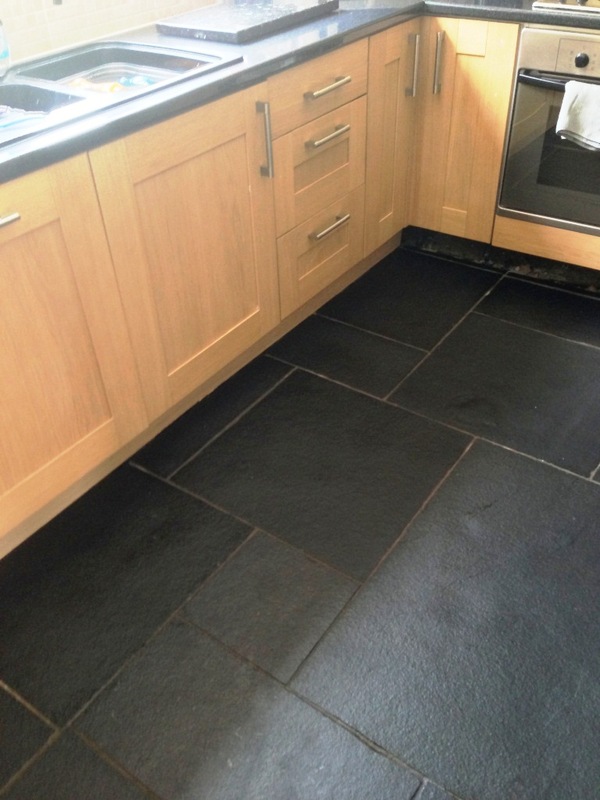 This client had recently had a black limestone tiled floor installed in the kitchen and dining area in his home on the northern border of Warwickshire. Unfortunately however the tiler had not sealed the tiles prior and struggled to remove the grout smears from the Limestone surface. 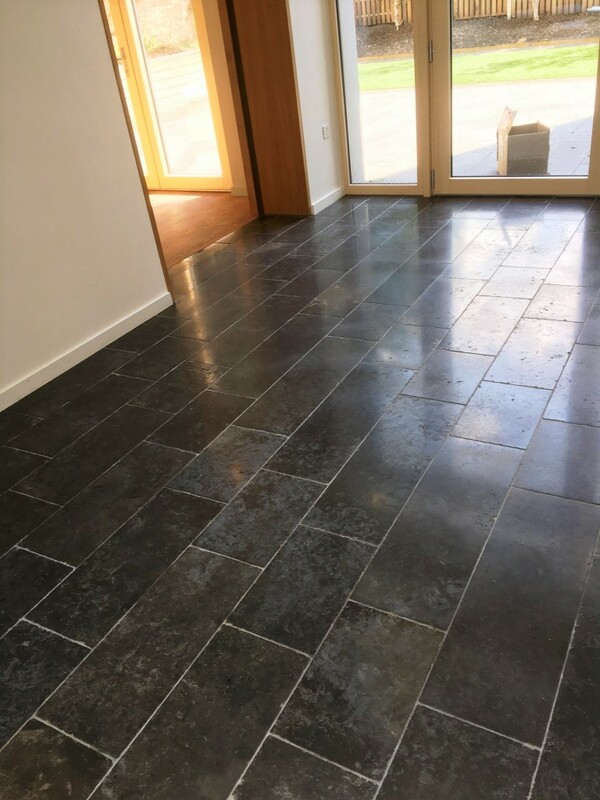 The tiles were then sealed trapping the grout haze under the sealer; naturally the client was far from happy and was instructed to remove the grout using an acid wash. The acid things turned the floor grey removing the oils in the floor from the factory and also caused the natural salts within the tile to rise to the surface. 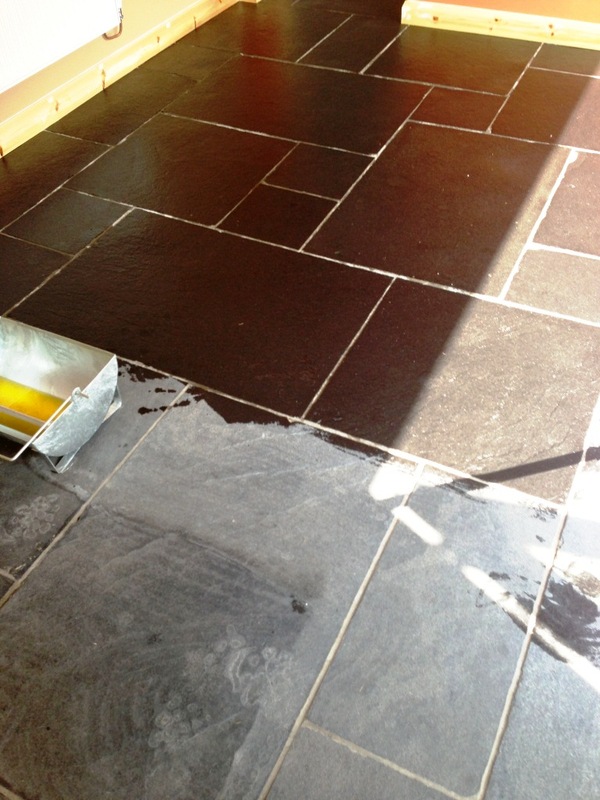 The tiles were then sealed with an external patio sealant without removing the existing surface sealer. All this compounded the problems in the floor causing it to mark easily and lose its colour; on top of that it had big cloudy white patches all over from the trapped salts. To resolve the problems with the floor it had to be fully stripped back and cleaned of all sealants and salt etc. 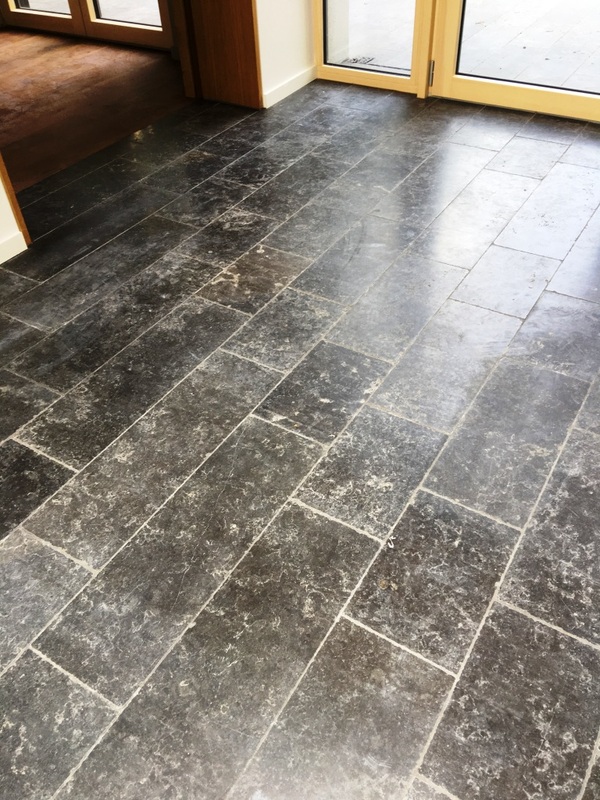 which was done by applying a solution of Tile Doctor Remove and Go combined with Nanotech UltraClean mopped on to the floor in two square metres at a time. The solution was allowed to soak into the floor for thirty minutes to allow the chemicals break down and then scrubbed using a rotary machine fitted with a black pad. The soiled solution was then extracted from the floor using a wet vacuum. This process was repeated across the entire floor until all the sealer had been removed. To remove the salts and remaining grout haze the floor was treated with Grout Clean-up which is an acid based cleaning product that is designed to penetrate below the surface and remove light grout smears (grout haze) as well as mineral deposits such as salts and efflorescence, again this treatment was applied two square meters at a time, quickly worked into the floor and removed with the wet vacuum. Once this process was complete the whole floor was washed at high pressure rinse three times to ensure all trace of chemicals had been removed. The floor was left to dry and when we came back the second day it was noticed that there were still some salts coming through to the surface of the Limestone, these areas were re-treated and the floor washed down again and left to dry as before. The floor looked much improved on the third day although it was still looking washed out. 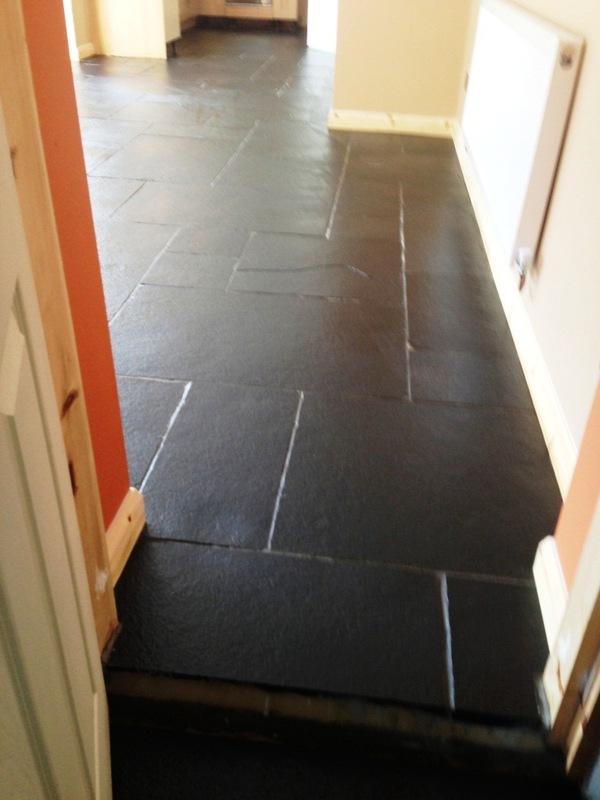 To put the colour back into the black limestone it was treated with stone oil with turns the floor back to black and then sealed with two coats of Tile Doctor Colour Grow which will protect the tile going forward. The floor now looks how it was intended and certainly the customer was pleased and left the following comment on our feedback system.